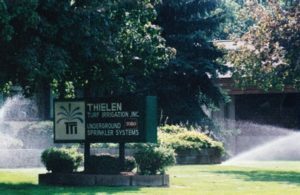 Irrigation Startup and Draining Services by Thielen Turf Irrigation, Inc.
Thielen Turf Irrigation, Inc. offers spring startup and fall draining of all irrigation systems, whether it was installed by us or not. For spring irrigation startup, a qualified member of our service team will turn on your water source or hook up your pump. We will then turn on every zone and inspect every head on that zone. We will check to make sure the heads are rotating properly and that they adjusted correctly to maximize watering efficiency. Each service member will cut the sod around the head to keep the grass from covering the sprinkler head and to keep the grass from growing into the nozzle which will plug the sprinkler head over time. Upon completion, the service member will set up your controller to water the customers desired times and days. For fall draining a qualified member of our service team will shut off the water source or disconnect the pump and clean the suction screen. They will blow air through your pipes making sure no water is left behind. For self-draining irrigation systems, we will go through the controller allowing time for all the water to automatically drain out of your lines. Upon completion, we will unplug your controller leaving your system shut down for the winter.